Want would you do if you found yourself orphaned and alone, and your only friend is your Dog, Rags? If you're and bright and adventurous lad like Jerry Dugan maybe you will join the Circus! 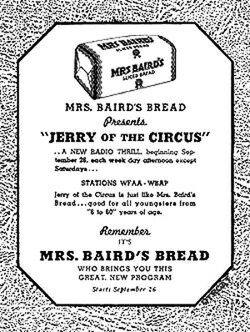 Jerry at the Circus, a 15 minute series for children, was syndicated in 1937. Taking place after the death of his family, the show followed the life and adventures of young Jerry Dugan raised by the circus owner, Sam Randall. Jerry has a note from his father that he "has circus in his blood". Jerry is taken in by Mr. Randall, owner of the Randall Bro.s Circus. He rooms with Bumps the Clown who soon uses Rags in his act, and Jerry eventually finds his way into the ring as well. He becomes good friends with many of the Circus people, and eventually finds that Decker, the animal trainer, is in fact his long lost uncle, Big Game hunter Dan Dougan. Dan will return to hunting, where there is no place for a young boy, so Jerry's guardianship is formally transferred to Mr. Randall. Circus owner, Sam Randall decides the best thing for Jerry will be to attend an Military Academy which leads to further adventure: Jerry at Fair Oaks. See also: Old Time Radio Circus Collection and Clowns in Old Time Radio. Be the first to comment on "Jerry of the Circus"